Today we’d like to share some FAQs about Extreme Cam Sizing! 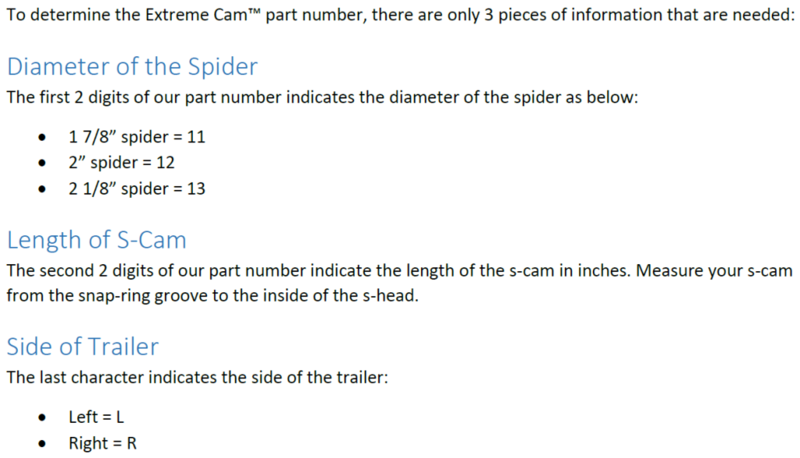 These are some of the most commonly asked questions that we get from stores and fleets on how to select the correct size Extreme Cam s-cam / bushing kit for their trailers. Hope this helps to answer some of your questions! 1. What information do I need to find the right size Extreme Cam s-cam / bushing kit for my trailer? 2. What if I don’t have that information? If you don’t have the above information, you can visit our cam lookup at https://extremebrake.com/products/extreme-cam/cam-lookup/. This online tool can help you convert any brand part numbers and give you the correct part number for our Extreme Cam system. It also has good information on how to measure your current parts if you are having trouble. 3. If I purchase an Extreme Cam kit, is there anything else that I need? Our Extreme Cam s-cam / bushing kits come with everything you need to convert any trailer. However, if your trailer needs a fabricated spider, you will also need a bolt on adaptor kit, which is Extreme Brake Part # CO89K. 4. What type of s-cam heads come in your kits? Type 1, 2, or 11, which replaces all 16 ½ diameter, Q, and Q+ s-cams. 5. To switch to our Extreme Cam system what do I need to purchase? You simply need to purchase the Extreme Cam s-cam / bushing kit. This comes with everything that you need to convert any trailer to the Extreme Cam system. Our kit comes with the s-cam, the cam tube, a universal mounting bracket kit, and the spacer kit. More questions? Feel free to check out our Product Installation Video that walks you through how to determine the correct part number and complete the installation of the Extreme Cam!